Charles Pansirna was the go-to photographer in Chicago’s Lithuanian community between 1916 and 1953. His portraits of weddings, babies, and funerals were the pride of immigrants building a life in America. It can be detected in shots of workers at their factory jobs, families at leisure in the park, or portraits of WWI soldiers dressed to go “over there.” Decidedly, these photos were taken for remembrance, but what is it that we recall? 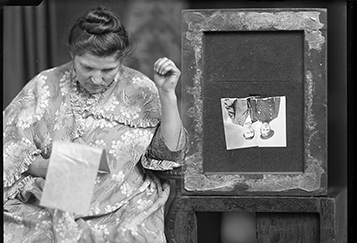 This exhibition examines a cross-section of the 1500+ Pansirna photos housed at Purdue Galleries in order to answer that question. Two contemporary photographers have been invited to show their work as a compliment and counterpoint to the narrative of pride and tradition. Artist Owen Mundy examines his “military family tree” through its military portraits, revealing the construction of military family imagery. Min Kim Park’s postmodern mother-daughter portraits question how much traditional portraiture leaves off the record. Pansirna’s photos give us much to recall from history, but upon close examination we begin to wonder just how much we have forgotten.